There have been significant advances in the prevention and management of stroke over the last few decades. Despite these important developments, stroke, both in the acute and chronic phases, remains a major cause of morbidity and mortality. The value of integrating palliative care principles and practices into stroke care management is being increasingly recognized across a range of domains including symptom management, assistance with complex decision-making, discharge planning, and end-of-life care. 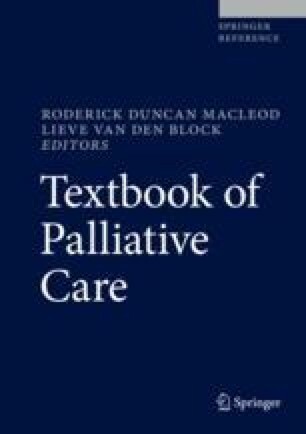 This chapter will explore the logistics, benefits, complexities, and challenges associated with the evolving relationship between stroke and palliative care services. Hackett ML, Anderson CS, House A, Xia J. Interventions for treating depression after stroke. Cochrane Database Syst Rev. 2008;(4):CD003437. https://doi.org/10.1002/14651858.CD003437.pub3. Intercollegiate Stroke Working Group. National clinical guideline for stroke 5th edition [Online]. London: Royal College of Physicians; 2016. Available: www.strokeaudit.org/SupportFiles/Documents/Guidelines/2016-National-Clinical-Guideline-for-Stroke-5t-(1).aspx. World Health Organisation. The top 10 causes of death. 2014. http://www.who.int/mediacentre/factsheets/fs310/en/. Accessed 18 Nov 2016.